Jose Mourinho was back doing what he does best at Wembley on Sunday - lifting silverware, as Manchester United beat Southampton in the EFL Cup final. Mourinho claimed the season's first major trophy and ensured success just months after his appointment despite a largely disappointing United performance which was rescued by two-goal inspiration Zlatan Ibrahimovic. The 35-year-old Swede and Mourinho - instrumental in bringing him to Old Trafford after the pair forged a bond at Inter Milan - are now the two central figures leading United forward. Can Mourinho and Ibrahimovic make Man Utd great again? Can Ibrahimovic inspire cup treble? Mourinho was brought into Old Trafford as the manager who is as close to a guarantee of success and trophies as it gets after a silverware-lined career at Porto, Chelsea, Inter Milan and Real Madrid. Old Trafford's joyless existence under Louis van Gaal demanded change and Mourinho was the identikit of the sort of manager required at the 'Theatre of Dreams' - a personality who would relish its history and surroundings rather than shrink from it. Mourinho was also available and had a third Premier League triumph on his CV only 12 months earlier at Chelsea. It meant United were prepared to set to one side his track record for short-term stays in exchange for a quick fix. 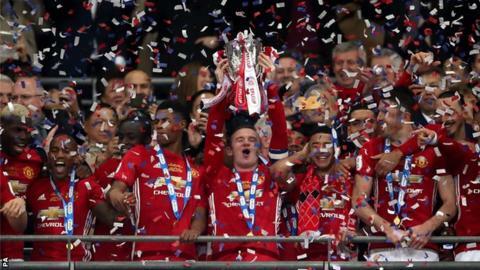 United were thoroughly unconvincing at Wembley, but Mourinho and his teams invariably find a way to win trophies. And so it proved as Ibrahimovic headed home an 87th-minute winner. Mourinho's move to bring the Swede in on a free transfer from Paris St-Germain was strategic and wise. He is a personality of equal stature and confidence, had a point to prove having never played in England and could provide the sort of charisma that had echoes of the great Eric Cantona. How United needed Ibrahimovic on Sunday because for long periods they were desperately average, outplayed by Southampton and had their hand held by Lady Luck throughout. If United are to build on this first trophy of the Mourinho era, Ibrahimovic's continued presence is essential because the EFL Cup final win is only the first building block in an edifice that requires considerable renovation after the dismal post-Sir Alex Ferguson years of David Moyes and Van Gaal. Mourinho, however, is safe hands when it comes to winning trophies and United remain in serious contention for two more in the Europa League and FA Cup. This is a good start, but the success-hungry Portuguese will want more. United's lean years simply could not continue with Pep Guardiola arriving at Manchester City, Jurgen Klopp settling at Liverpool and Antonio Conte conducting a brilliant transformation of Mourinho's former charges Chelsea. Mourinho won the Premier League twice, as well as the FA Cup and two League Cups, in his first spell at Chelsea. He won 124 games out of 185 in that period, a win ratio of 67%. He won 80 out of 136 (59%) in his second stint at Stamford Bridge - winning the title again and the League Cup - while he has won 28 of 43 at United at an impressive 65%. The statistics add up to exactly what is required at Old Trafford. He will chase the Champions League prize either through the Premier League or the Europa League because this is vital to his future plans. In the meantime, Ibrahimovic once again proved himself indispensable. He was the difference here. He made the decisive contribution to clinch a game United did not deserve to win. He is head and shoulders - quite literally - above every other player at United. He has scored 26 goals this season, with Juan Mata next with nine. He has had 143 shots compared to Paul Pogba's 117, and 65 shots on target compared to Pogba's 39. Ibrahimovic tops every significant attacking table. United are a long way from their former greatness - but this EFL Cup final proved conclusively that if they are going to get anywhere near that status again, Ibrahimovic is the man who is integral to Mourinho's plans, even at 35. Does EFL Cup win make season a success for Man Utd? United winning a Wembley final equates to tangible success - but successful seasons are measured in different currency in the modern era and Mourinho will need more than this to achieve full satisfaction. Van Gaal, who led United to FA Cup success in May, was on his way out almost as soon as he placed the trophy on the same table Mourinho sat at on Sunday. If winning the FA Cup was not enough to satisfy United's desires for success under Van Gaal then it would take a re-drawing of the boundaries to now paint the EFL Cup as fulfilling their ambitions. There is a key difference in mood here - whereas Van Gaal's Wembley win felt like the end of a story, this victory, for all its good fortune, had the sense of new start. Mourinho must now make this season feel like the full package of progress by leading United back into the Champions League, which is surely the minimum requirement after the world record transfer expenditure of £89m on Pogba and the Ibrahimovic coup. And United still have an excellent chance of ensuring this season can be viewed as a success as they stand among the favourites for the Europa League, which offers a Champions League place to its winners. Mourinho has already painted the last-16 meeting with Russians FC Rostov as a tough tie but he also has the chance to reach the top four in the Premier League, with United only two points behind Arsenal. United have a potentially hazardous FA Cup quarter-final tie at Premier League leaders Chelsea to negotiate, but this is a season still moving on three fronts after securing that first major trophy. The new reality is, though, that while the EFL Cup provides a trophy and satisfaction, United's season will only be a success if they conclude it back in Europe's elite competition. What now for Wayne Rooney? Wayne Rooney lifted the EFL Cup and demonstrated he is the consummate team player with his wild celebration of Ibrahimovic's winner - but this was still a player on the outside looking in. The 31-year-old, who this week confirmed he was staying at United despite speculation linking him with a move to China, was denied a piece of the action by the match-winning contribution of the elder statesman who has usurped him as the team's spiritual leader. Rooney was stripped and ready for action. With the words of Mourinho ringing in his ears and assistant manager Rui Faria showing him the diagrams United hoped would lead to a defining contribution, Ibrahimovic struck. The United and England captain was sent back to the bench with no chance to add to his 250 goals for the club as Marouane Fellaini was called in for a late lockdown. It was a symbolic moment. United's captain for the day, Chris Smalling, let the club's all-time record goalscorer Rooney lift the trophy and it is to his credit that there was no sense of personal denial or disappointment that he was left out then denied even the smallest part. Rooney was delighted for his team-mates, which is a mark of his approach. Despite this, there was no escaping the belief the guard has changed at Old Trafford. Rooney is no longer the main man - he is now well down the ranks and this was simply another piece of evidence of his declining influence and the credits rolling on a magnificent career at United. Why the long face, Jose? Mourinho's downbeat demeanour was a talking point throughout the EFL Cup final as he cut an unsmiling, subdued figure who barely showed any emotion even when United scored. He insisted afterwards he was delighted: "I am very happy. It is important for the fans, for the club and for the players. I always try to put myself in the secondary position but the reality is it is also important for me." United's performance was not designed to lighten Mourinho's mood until the moment of victory and it is likely his behaviour was shaped by concerns about how Southampton dominated his side for long periods and troubled his defence - normally his tactical strong point - throughout. Victory will, however, lighten his mood, bolster his already high standing with United's fans and release any personal pressure he may have been feeling.